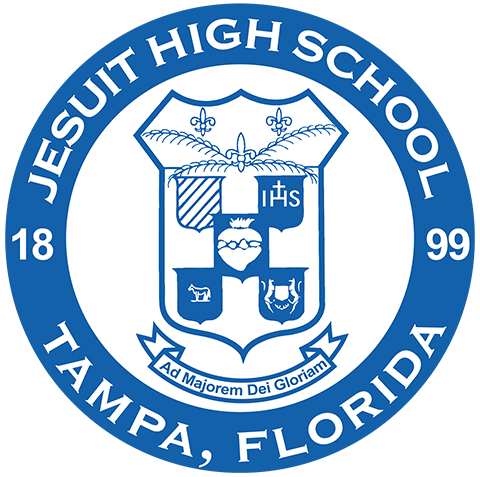 Since 1899, Jesuit High School of Tampa has depended on the generosity and support of thousands of donors. This involvement helped the school develop into a respected and beloved educational institution for more than a century. The continuing generosity and participation of alumni, current and past families, and community friends ensures that Jesuit High School will continue to serve its mission for generations to come. 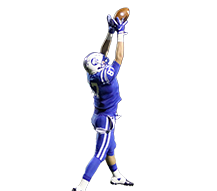 Please click on the links in this section to view the many ways in which you can give to Jesuit High School. Jesuit High School president Fr. Richard C. Hermes, S.J. made an historic presentation on Sept. 19, 2015, announcing the public phase of the school’s extraordinary $35 million “For Greater Glory” campaign to preserve and strengthen Jesuit in Tampa for generations. 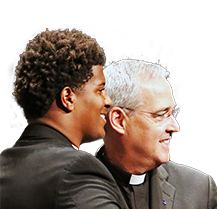 The landmark campaign, for which an amazing $27.5 million already had been raised by Sept. 2015, and $30 million by Feb. 2016, ensures the school will continue forming young men in the Tampa Bay area in the 470-year tradition of Jesuit education - and will dramatically transform the campus. Fr. Hermes made his presentation at the President's Circle Dinner gala, before more than 400 of the school’s top supporters at the Renaissance Hotel in Tampa. 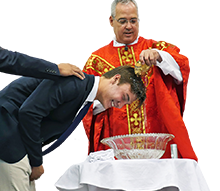 Nearly 60 years after moving from downtown, where the school was founded in 1899, to Himes Ave., the campaign will secure the legacy of Jesuit in Tampa for another 60 years and beyond. Also announced at the President's Dinner was the largest gift in the history of the school. Marty and Ted Couch ’54 have made a momentous $2.5 million donation to Jesuit, the school’s first of more than $2 million. The campaign supports the school’s Strategic Plan, which was developed in 2011. 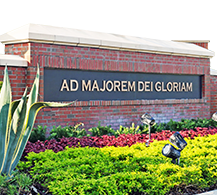 “For Greater Glory” represents a renewal of school life by investing fully in Jesuit’s people, programs, and facilities – starting with a robust, sustainable financial aid program. Jesuit has been committed to educating any qualified boy who desires to attend since its beginnings. This school year, for example, more than 1/4th of Jesuit’s students are receiving a total of $1.68 million in financial aid. The campaign also focuses on school personnel, and on the expansion and development of student programs. 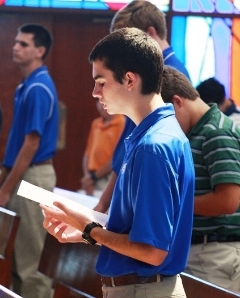 Jesuit is committing the resources to attract, develop, and retain the finest faculty and staff, while also furthering the school’s mandate to provide programs and opportunities to assist students in their total formation – academically, in their life of faith, in the development of their gifts and talents, and in their growth as leaders, as “Men for Others” who make a difference in their communities, and especially in their service of those who are most in need. Finally, the campaign will transform the campus, as it supports Jesuit’s master plan and calls for major development the next few years. Though significant work has been done on a regular basis to upgrade campus facilities over the past half-century, in many regards Jesuit remains much the same as it was originally built in the late 1950s and early 1960s. The reshaping began in 2014 with the construction of the striking new campus perimeter, which provides a beautiful, collegiate presence along Himes Ave., and now it will continue with Phase 1 in 2016. Phase 1 includes a new chapel, the Chapel of the Holy Cross, at the heart of campus, where St. Anthony’s Chapel's has been for nearly 60 years, where the entire Jesuit student body (currently about 770 students) gathers each morning for Convocation, and where all-school Mass and other vital spiritual events are held. The new Chapel will enhance the school’s Catholic, Jesuit identity, and allow for future growth in enrollment. Please view this video from Feb. 2016 about the new Chapel and about Phase 1 breaking ground in the summer of 2016. Also part of Phase 1 is a new Administration and Student Services building. A grand, two-story, 32,000-square foot structure, it will be the face of Jesuit along Himes Ave, a dynamic and enduring presence. It will be home to numerous school departments, notably counseling and college admissions. When the Chapel and Administration building are complete, Phase 2 will begin. It will include a comprehensive new two-story, collegiate-style Student Activities Center, with an adjacent 500-seat Dining Hall among its many amenities; a spectacular new Fine and Performing Arts Center with a 450-seat theater/auditorium; and a new two-story, state-of-the-art Science and Math building, complete with independent labs equipped with the latest technology, to further Jesuit's academic excellence in the increasingly advanced STEM subjects. Numerous other campus enhancements will occur during Phases 1 and 2, such as bricked colonnades on several buildings, a renovated football press box, and a Grotto at the iconic Jesuit Bell Tower. The architects for the campus master plan are Cooper Johnson Smith, and the architect for the new Chapel is Duncan G. Stroik. The construction managers are Batson-Cook. Fr. Hermes also acknowledged at the President's Dinner announcement the many generous contributors who have helped the campaign come so far. In 2013, Richard Gonzmart ’71 made the first $1 million donation to the school from an alumnus. Many other alumni and parents have since made gifts of such generosity, including John Oliva ’60, John Hamilton ’77, Ray Hyer, P ’01, and several anonymous donors. The President's Dinner was arranged by Jesuit's award-winning events coordinator Jane Younger and featured Jesuit students. The emcee was Ryan Cox '17, and student artists, musicians, and the award-winning competitive Robotics team all displayed their talents during the course of the evening. Fr. Hermes indicated the Strategic Plan has served as the blueprint for much growth the past few years, and that it set the foundation to establish the “For Greater Glory” campaign. For more information, please contact Nick Suszynski ’98 in the Development Office at (813) 877-5344 ext. 704. Those who remember Jesuit in their wills, bequests and other estate gifts such as life insurance, annuities, remainder trusts, etc., are members of the 1899 Bequest Society, and are vital to preserving the future of Jesuit High School. 1899 Bequest Society members are those who have indicated in writing that they have made provisions for Jesuit High School in their estate plans. In addition to being a meaningful gift to Jesuit High School, “planned giving” helps to reduce or eliminate taxes on capital gains and federal estate taxes. Please check with your financial planner or accountant for more details on arranging for a planned gift, and the personal benefits associated with that charitable gift. If you have made arrangements for a gift to Jesuit in your estate planning and wish to be listed as a member of the 1899 Bequest Society, please contact the Development Office at (813) 877-5344, ext. 704, or email. All 1899 Bequest Society members are also listed each year in Jesuit High School’s President’s Annual Report. Click here to view a listing of all 1899 Bequest Society members. The Annual Fund is critical to the fiscal health of Jesuit High School because it helps the school bridge the tuition gap - Jesuit's tuition is well below the annual cost to educate each student. 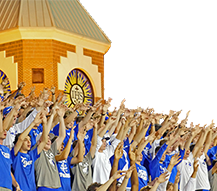 It is through the generosity of Jesuit’s Annual Fund donors that the school is able to defray the cost of providing tuition assistance; minimize annual tuition rates; and supplement operating and facility maintenance expenses throughout the year. Ultimately, it is this generosity that allows the school to continue its legacy of developing "Men for Others." For convenience, you may make your Annual Fund gift now through our online donation page. For assistance, please contact Annual Fund Director Molly Smith at msmith@jesuittampa.org,or (813) 877-5344, ext. 716. Making contributions to Jesuit has never been easier – no checks to write, no stamps to stick, and no payments to remember! Your monthly, recurring, tax-deductible gift will automatically be processed on your credit/debit card. With monthly contributions, you will find it easier than ever to "show your stripes" for Jesuit High School. All Loyal Tiger members will receive a special "Loyal Tiger" car decal and will be recognized in our President's Annual Report. You may increase, decrease, or suspend your monthly gift at any time. To enroll in the Loyal Tigers Club monthly giving program, please contact Holly Thomas at 813-877-5344 ext. 707. 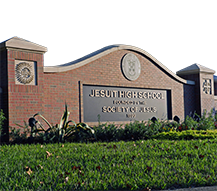 Jesuit High School’s Financial Aid Program, which provides tuition relief to academically qualified students of disadvantaged or low-income families, is dependent upon support from its educational endowments. The money raised for an endowment is perpetual because only the investment returns are used toward financial aid, while the principal remains untouched. Simply put, the principal generates interest, which in turn is used as financial aid. Jesuit’s Financial Aid Endowment Program does not consist of just one endowment, but rather several fully funded and partially funded endowments. Jesuit needs to “grow” this endowment program to keep pace with escalating operating and tuition costs and to increase the total amount of aid distributed each year. A complete, current list of all of Jesuit’s named endowments is printed each year in the school’s President’s Annual Report. When donating to Jesuit, you may direct your donation to any of our named endowments if you so choose. If you have any questions, please contact the Development Office at (813) 877-5344, ext. 704. You might be able to double the size of your gift to Jesuit simply by checking with your employer about matching gifts. Many companies match gifts their employees make to non-profit organizations such as Jesuit High School. With no additional expense to you, this tremendous benefit provided by your employer enables you to double the dollar amount of your gift to Jesuit High School. You will receive full acknowledgement in the school’s Annual Report for the total amount of the matching gift. For example, if you donate $500 and your employer matches your gift, you will be credited for a $1,000 gift in the President’s Annual Report. 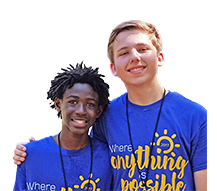 Matching Gifts Program Lists: If you are considering making a gift to Jesuit, please click this link of matching gift companies to search your company’s name. If it is not on the list, please check with your employer to see if your company has a matching gift program in place. If you are searching your employer's matching system, you may need Jesuit's Tax ID/Employer Identification Number. It is 59-0914207. Gifts in-kind, which are donations of goods and services, while not monetary in nature, result in saving the school added expenses to cover the costs of materials, services, and labor. Jesuit High School is grateful to those who donate goods and services to the school. The school also appreciates and encourages those who are capable to serve the school through their time and talent by volunteering their professional services. As is the case with all monetary contributions to Jesuit, in-kind gifts of materials and services are recognized each year in the President’s Annual Report. The Jesuit Blue Pages, a business directory, offers Jesuit High School supporters the chance to join a comprehensive index of our local families and friends in their respective industries. As all proceeds help Jesuit High School defray the cost of providing tuition assistance to students, you are not only reaching a business clientele, but helping to directly support the school’s mission. Every Thursday, the Jesuit Alumni Association highlights a business from the current year's Jesuit Blue Pages on the Alumni Association's Facebook group page and the LinkedIn group page, expanding your reach to over 2,100 active alumni online! Interested in advertising in the Jesuit Blue Pages? Please contact Jane Younger, P '06, '09, Events Coordinator, at 813-877-5344, ext. 706 for more information. Click here to view the 2018 Blue Pages. Jesuit High School also accepts stock transfers. For stock transfer instructions, please contact the Development Office at (813) 877-5344, ext. 716.